Yesterday was the excellent DDD8. Thank you to all who attended. 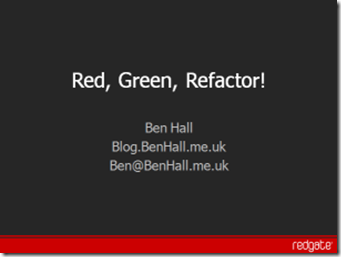 I gave a grok talk and a full presentation. The grok talk was on Albacore, while the full presentation on Testing ASP.net Web Applications using Ruby. The slides are below. If you have any questionsfeedback then do please let me know. Don’t forget, if you are interested in learning more about Testing ASP.net then my book has recently been released. This weekend I was lucky enough to present ‘Creating extensible application using MEF’ at the DDD Belfast conference in, well, Belfast. The conference itself we really well and I was happy with my session. Slides can be found on Slideshare any embedded below. Feel free to download the Finished Demos from the presentation. Photos can be found on Barry’s blog, who I have to say did a great job of organising the conference, as did Craig and Phil. The conference season is upon us and we have some amazing events coming up over the next few months. All of these conferences are free and organised by the community. They are a great opportunity to learn a wealth of information and meet new people at the same time. Sadly I won’t be speaking at this one. Yesterday, Developer Day (DDD) 7 was held at Microsoft UK. 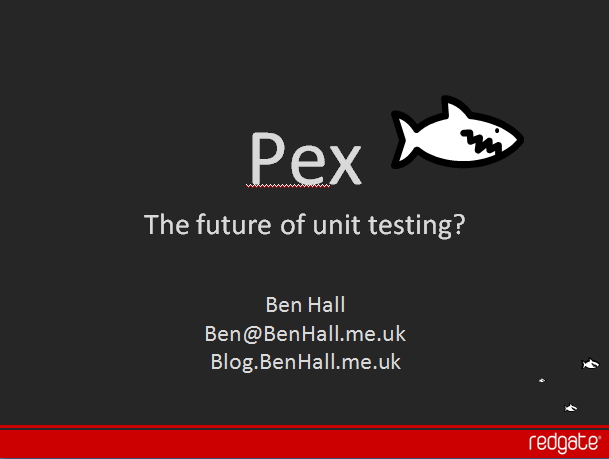 I delivered a presentation on Pex, a new project from Microsoft Research. 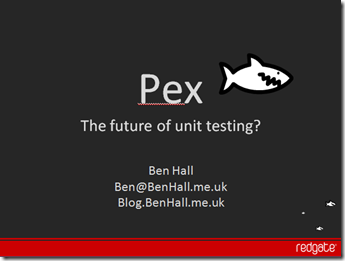 I provided an introduction into Pex, the problem it attempts to solve, how Pex works in the real world and finally where I think the future of unit testing and Pex is heading. I had a great day and I was very happy with my session – the demo gods where with me. Based on tweets via twitter and other comments, it was generally well received. Thank you to everyone who attended, when feedback opens on the website please be sure to leave your comments as they are all taken into account. DDD7 also had Channel 9 recording all the sessions, if you couldn’t attend – don’t worry, hopefully the videos will be online in the new year! This weekend was the DDD Ireland conference in Galway. 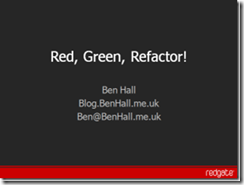 I was there presenting my Red, Green, Refactor presentation which outlines the concepts of Test Driven Development (TDD) and demonstrates some of the techniques via code. I think the session went down well, but it’s always difficult to tell.